If you're not already familiar with Kim St. Jean's work, then you obviously do not like metal! Kim has already written books on working with metal (my reviews links are below), and now she has tackled her love of wire in a new book: Colorful Wirework Jewelry, published by Kalmbach. Wire with a fun twist, though...lots of COLOR! 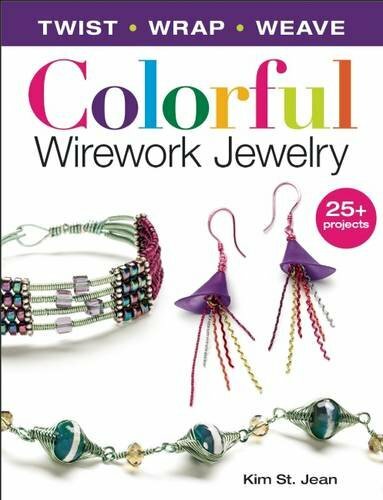 Kim has wrapped, coiled, twisted, and woven her way through 28 fun wire projects that feature colored wire along with bright beads and cabochons. If you're a beginner, you'll be treated to all the basic information that you need to be successful with these projects. If you are more advanced, I think you'll find them to be a great jumping-off point to inspire your own exploration. If you want to get a look at some of Kim's work, one of the best sources is her Pinterest boards.